There’s no doubt that many a wild and crazy night of drinking has been made all the more wild and crazy by that one secret ingredient: a carefully chosen drinking game, that can turn a group of people into a party, and turn a few drinks with friends into a night to remember. A simple game that requires no apparatus, Fuzzy Duck can also be the cause of great hilarity among drinking revellers. In the simplest version of the game each member of a circle says the words ‘fuzzy duck’ in turn, until someone says ‘does he?’, after which the direction changes. It sounds easy but the potential for mistakes in this game is quite incredible. The player who makes a mistake, of course, drinks. 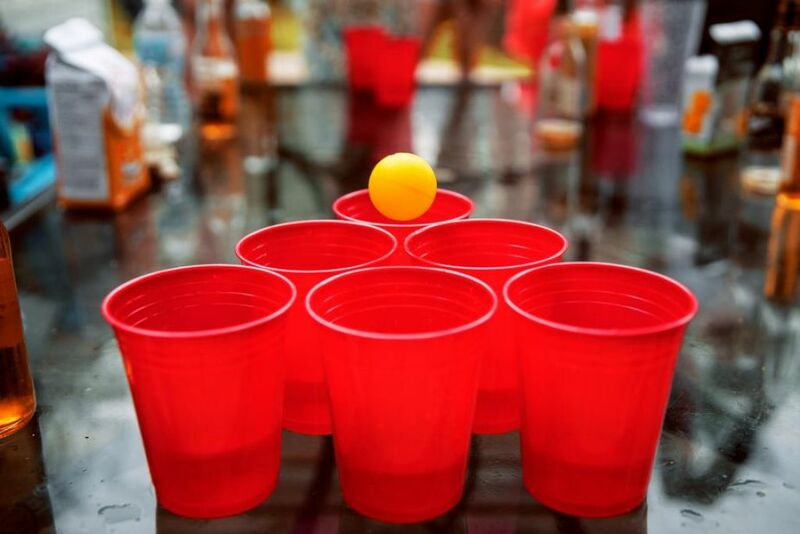 Beer Pong is a favourite to North American students, but is also played throughout the world and in places where drinkers are feeling a bit sporty. The game involves placing ten cups half-filled with water in a triangle formation at each end of a long table, and two teams take turns to try to throw ping pong balls into the cups at the opposing end. It goes without saying that losing results in drinking, or any other possible forfeit. A little-known game, Horse Racing involves placing eight paying cards faced down in a line on a table. This is the track. The four aces are places at one end of the line, perpendicular to it. Each player chooses a suit and places bets on their ace winning. One player is then chosen to turn over the cards in the pack one at a time and shout out the suit of that card. If the card is diamonds, then the ace of diamonds will move along the track by the length of one card. Before all the cards are turned over, one of the aces will have reached the finishing line and we have a winner! Drink While You Think is another apparatus-free game in which one player begins by saying the name of a celebrity, for example, Brad Pitt, then the next player will need to say another celebrity beginning with the first letter of the surname, P in this case. The direction is changed when the initials are the same, for example, Marilyn Monroe. It might seem a bit of a challenge to try out a drinking game while beerbiking, but why not give it a try? If not, just keep your drinking games until after your next trip on the Beer Bike Budapest.